I wrote the cover package for the April issue of Word&Way (a Baptist magazine in the Midwest). The focus is on the "Missouri Plan," a unique period of Baptist cooperation at the end of the 1800s and start of the 1900s. The articles explore what happened and why, as well as how this might inspire people today to cooperate. The first article, Missouri Once Offered Unique Model for Baptist Cooperation, looks at the past by considering what the Missouri Plan was, its origin, and its impact. The piece includes comments from Adrian Lamkin (an American Baptist leader in Illinois who previously served as director of the William E. Partee Center for Baptist Historical Studies at William Jewell College in Missouri) and Danny Chisholm (senior pastor of University Heights Baptist Church in Springfield, Missouri). The article also includes some historical quotations. 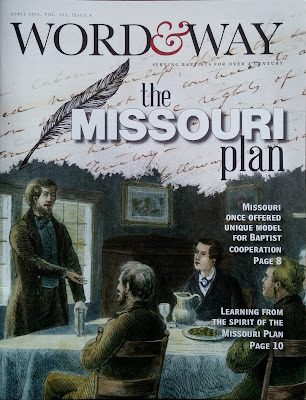 The second article, Learning from the Spirit of the Missouri Plan, considers what this model of cooperation might mean for the present and future. The article includes comments from Jerry Cain (chancellor of Judson University, an American Baptist school in Illinois), George Bullard (general secretary of the North American Baptist Fellowship), and Jim Hill (executive director of Churchnet and president of the North American Baptist Fellowship). I enjoyed working on these pieces and thinking about this unique historical moment (and I appreciate Cain for inspiring the package). I hope the articles will inspire people to think creatively about how we can work together to accomplish more.